Glasnevin is said to have been founded by Saint Mobhi in the sixth century as a monastery. St. Columba of Iona is thought to have studied under St. Mobhi, Iona Road in Glasnevin named in his honour. The church on Iona Road is called Saint Columba's. It is thought that the Battle of Clontarf was fought on the banks of the River Tolka in 1014 (a field called the bloody acre is supposed to be part of the site). The Irish defeated the Danes in a battle, in which 7,000 Danes and 4,000 Irish died. When Norman King of England Henry II arrived in 1171, he took control of much land, and then parcelled it out amongst his supporters. Glasnevin ended up under the jurisdiction of Finglas Abbey. Laurence O'Toole, Archbishop of Dublin, took responsibility for Glasnevin. When King Henry VIII broke from Rome an era of religious repression began. During the Dissolution of the Monasteries, Catholic Church property and land was appropriated to the new Church of England, and monasteries (including the one at Glasnevin) were forcibly closed and fell into ruin. By 1667 Glasnevin had expanded - but not by very much; it is recorded as containing 24 houses. The development of the village was given a fresh impetus when Sir John Rogerson built his country residence, "The Glen" or "Glasnevin House" outside the village. Glasnevin became a township in 1878 and became part of the City of Dublin in 1900 under the Dublin Boundaries Act when it received the Royal Assent on August 6, 1900. The parish population was recorded as 1,001, of whom 559 resided in the village. Glasnevin was described as a parish in the barony of Coolock, pleasantly situated and the residence of many families of distinction. When Drumcondra began to rapidly expand in the 1870s, the residents of Glasnevin sought to protect their district and opposed being merged with the neighbouring suburb. One of the objectors was the property-owner, Dr Gogarty, the father of the Irish poet, Oliver St. John Gogarty. Glasnevin remained relatively undeveloped until the opening up of the Carroll Estate in 1914, which saw the creation of the redbrick residential roads running down towards Drumcondra. The process was accelerated by Dublin Corporation in the 1920s and the present shape of the suburb was firmly in place by 1930. The house and lands of the poet Thomas Tickell were sold in 1790 to the Irish Parliament and given to the Royal Dublin Society for them to establish Ireland's first Botanic Gardens. The gardens were the first location in Ireland where the infection responsible for the 1845–1847 potato famine was identified. Throughout the famine research to stop the infection was undertaken at the gardens. The 48 acres (190,000 m2) which border the River Tolka also adjoin the Prospect Cemetery. In 2002 the Botanic Gardens gained a new two-storey complex which included a new cafe and a large lecture theatre. 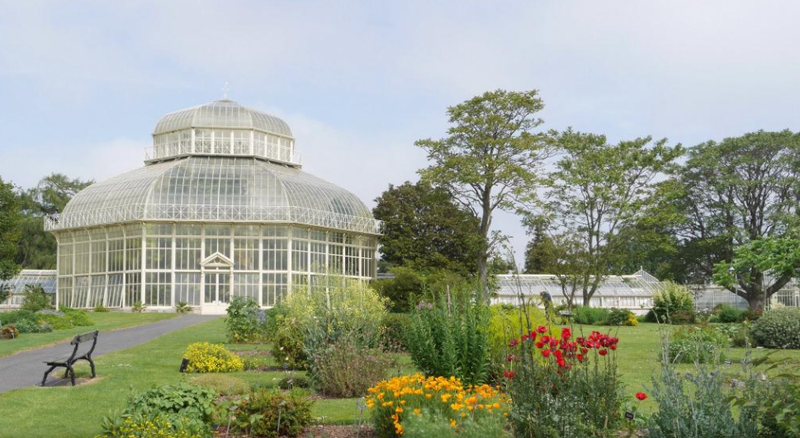 The Irish National Herbarium is also located at the botanic gardens. Prospect Cemetery is located in Glasnevin, although better known as Glasnevin Cemetery, the most historically notable burial place in the country and the last resting place, among a host of historical figures, of Michael Collins, Eamon DeValera, Charles Stewart Parnell and also Arthur Griffith. This graveyard led to Glasnevin being known as "the dead centre of Dublin". It opened in 1832 and is the final resting place for thousands of ordinary citizens, as well as many Irish patriots. Glasnevin is also a parish in the Fingal South West deanery of the Roman Catholic Archdiocese of Dublin. It is served by the Church of Lady of Dolours. The church underwent some refurbishment work inside and in its grounds and car park during the first half of 2011. A timber church, which originally stood on Berkeley Road, was moved to a riverside site on Botanic Avenue early in the twentieth century. The altar in this church was from Newgate prison in Dublin. It served as the parish church until it was replaced, in 1972, by a structure resembling a pyramid when viewed from Botanic Avenue. The previous church was known locally as "The Woodener" , the new building is still known to older residents as "The new Woodener" or "The Wigwam". Griffith Avenue, which runs through Glasnevin, Drumcondra and Marino. The avenue spans three electoral constituencies, and is the longest tree-lined avenue in the Northern Hemisphere with no retail outlets. It was named after Arthur Griffith who was the founder and third leader of Sinn Féin and also served as President of Dáil Éireann. Arthur Griffith was buried in Glasnevin Cemetery.